Oh dear. 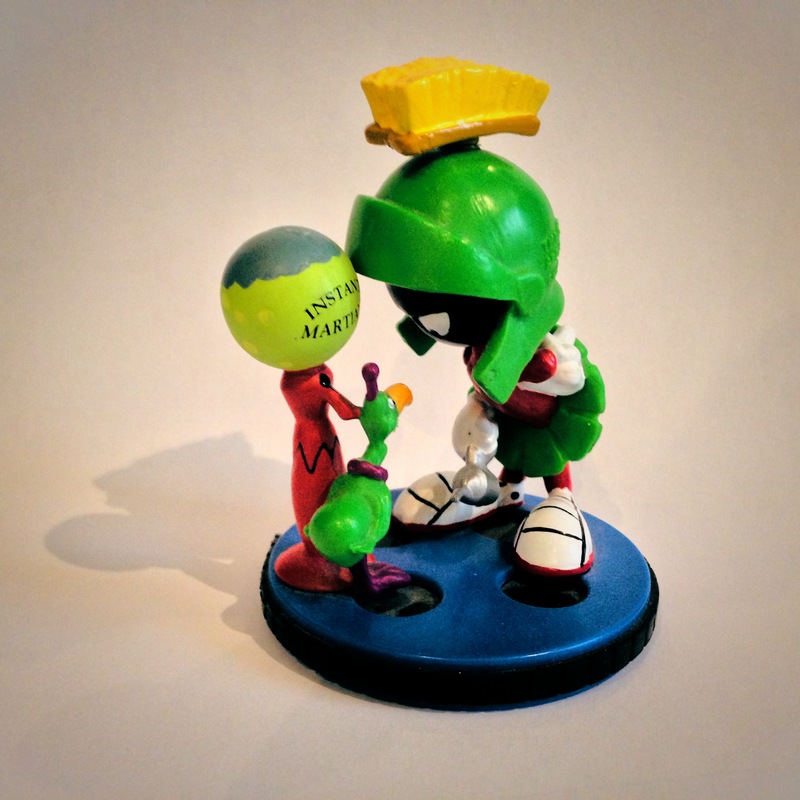 Now I shall have to create more Martians. When we were kids the television got 3 channels when we were lucky and had adjusted the rabbit ears just so – on the odd Saturday morning when the weather was clear and we had added little wads of tinfoil to the ends of the antenna we might pick up a station in the US getting a full 4 hours of cartoon heaven before being pulled away to more constructive pursuits like cleaning our rooms or doing the homework we had tried to bury in the bottom of our schoolbags. Memorizing the provincial capitals wasn’t half as easy as the words to “This Is It”, the theme song of The Bugs Bunny Show and we would pretend to be Bugs and Daffy strolling across our living room stage with no one but a disinterested cat for an audience. Rolling around on the carpet howling like idiots wasn’t unusual because Chuck Jones and Friz Freleng knew just what look, what line would get the loudest laugh but it was only many years later when our own rugrats were doing the same that some of the jokes Elmer made and the subtlety of Sam Sheepdog came to be fully appreciated. Humour is relative – no matter what culture you are from, whether you are old or young, serious or silly, the Two Cents Tuesday Challenge absolutely knows that there is something out there that you find – Funny. Because sooner or later this applies to all of us – thanks for entering! Here ya go! Happy Friday!!!! Thanks for the not so cuddly but very cute entry! Thanks for your “finny” entry! There are many ways to restate this obvious – this is one of the best I’ve seen in a while – thanks for entering! I hope you like it – and thank you for inspiring! Welcome – this entry is something I have really never seen before!